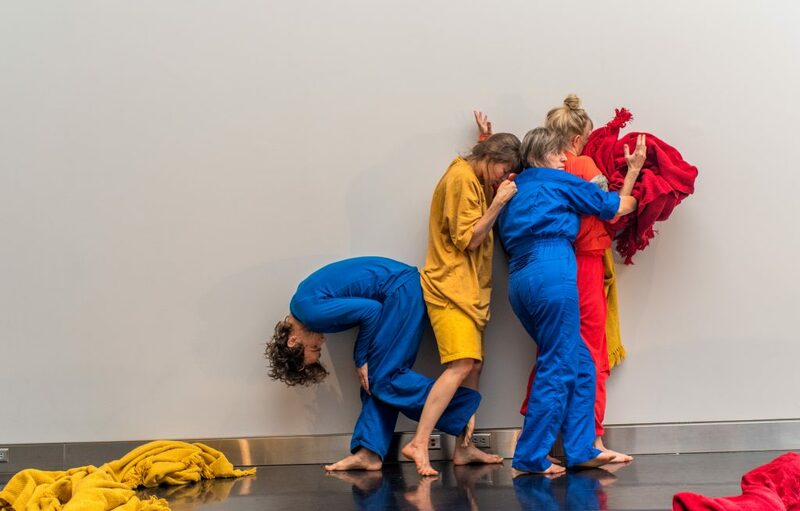 Review: Observers and the observed get “closer” in a BodyCartography work that shines a light on intimacy and human interaction. There’s breaking the fourth wall and then there’s disintegrating it into nothing. For “closer,” the two-part performance by BodyCartography Project that culminates this weekend at the Red Eye Theater in Minneapolis, dancers opt for the latter option, seeking intimacy between performers and audience members in a sometimes awkward, sometimes inspired embrace. The first part of “closer” began earlier this summer. BodyCartography Project set up camp at various public sites around the Twin Cities, initiating a series of one-on-one dances. Visitors could sign up for a dance and be paired with one of the performers, who would take the observer on a private interactive experience, exploring the architecture and nature of the city. 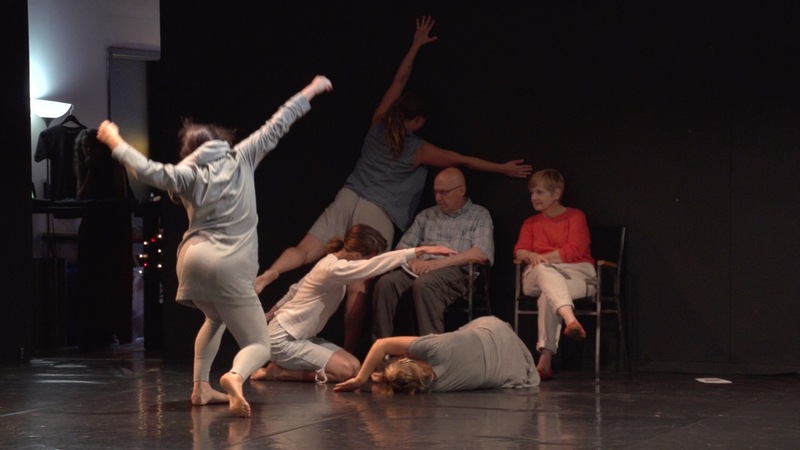 Without any instructions, some audience members danced along with their dancer, while others simply watched, with varying levels of engagement. Since the dances took place in public places, random passersby became part of the work. Whether it was people who happened to be walking by or, in the case of events such as Northern Spark where they might be more aware a public art performance was happening, they became a secondary audience watching the dancer and observer/partner. That proved eventful particularly at City Hall, where at times the public dances were greeted with concern and even disapproval by the occasional security officer or Downtown Improvement District ambassador for behavior out of the bounds of normalcy. As opposed to the more open spaces that “part 1” inhabited, “part 2” is enclosed, so as audience members wandered into the Red Eye and the one-on-one dances took place, they watched not only the dancers but the audience-observers, as well as the larger audience seated along the four sides of the theater. Eventually, the performance evolved into something a bit more like a traditional dance concert. Beginning with an improvised solo, trio and then duet, the dancers embarked on a more choreographed section that borrowed some of the spontaneity of the improvised pieces, but with more coordination and moments of simultaneity. These more formalized sections, even when the dancers improvised, lost some of the intimacy established in the evening’s first moments, particularly during the trio, when music was introduced. Then the show took another turn toward full-out ritual. The dancers froze as statues and begin to shake uncontrollably, as if possessed, followed by a sudden lights out. In the darkness, the dancers hummed and grunted, panting in a rather long section of darkness. It was an uncomfortable communion, like listening to some sort of secret ceremony or perhaps a sexual act. At certain moments, lights would illuminate the dancers in various poses. On opening night, as the light returned to reveal the dancers crawling in diagonal lines, they were slightly upstaged by a bat that swooped over them and around the audience, slightly killing the moment. 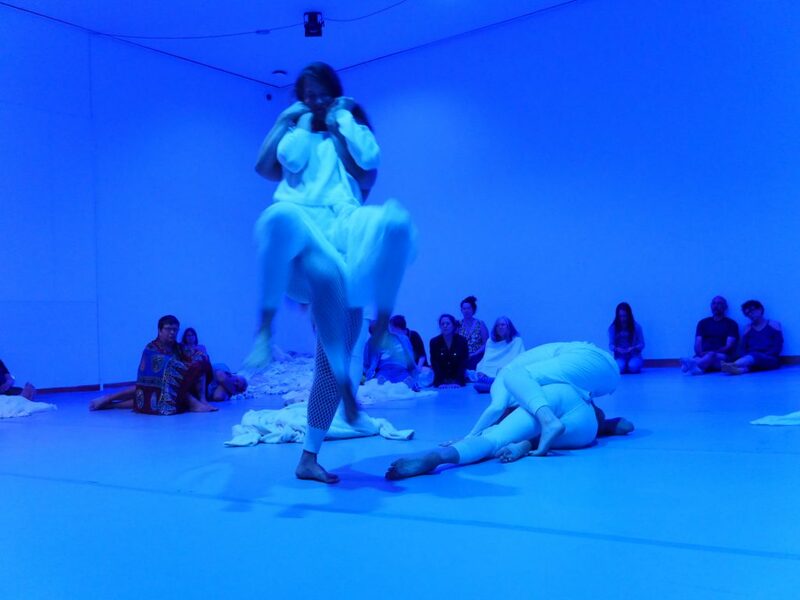 At points in “Part 2,” the work evolves into a more traditional dance concert. The evening concluded with the dancers pulling the audience members up out of their seats, enclosing them in the center of the theater, dancing around them in a circle. As DJ Wzz Wnshp played music, the dancers moved through the audience, instigating a dance party. It worked pretty well, considering this is a Minnesota audience we are talking about. Most everyone tried to be game for the participation, at least for a little while. There was some dispersal, but then the dance party started up more organically on its own after 10 minutes or so. Like much of “closer,” it offered some fascinating illuminations of human behavior and interaction.